A number of containers both on and off the GCR have been surveyed with a view to establishing a representative selection. It is clear that we can't preserve all of them; the survivors are generally in a bad to awful condition having spent more than half of their 50-year lives standing in industrial yards and farmers' fields. They were of fairly light construction in the first place and many years of only limited maintenance have not been kind. The container numbers consist of a prefix letter or letters denoting the type, a unique serial number, and a suffix denoting the company which built it. All of our containers carry a 'B' suffix indicating that they were built by or for British Railways. Pre-Nationalisation examples acquired different suffixes under BR ownership. 'Diagram' numbers refer to the design details in the BR diagram book. In some cases more than one diagram exists for containers intended to fulfil the same function. 'Lot number' refers to the particular order number under which a given batch of containers was built. It was not unknown for a single lot to include containers to more than one diagram! 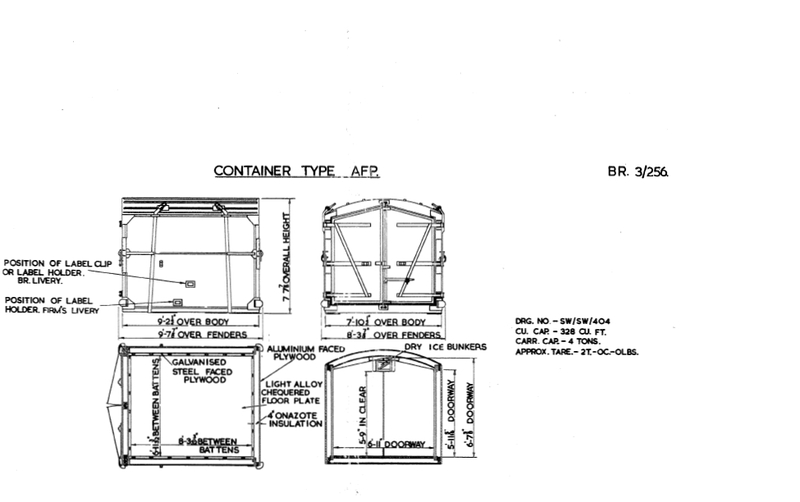 The 'A' type containers were 7' 6" long and had doors at one end only. They were a general purpose container and could carry either 4 or 5 tons. Two could be carried on a single 'Conflat A' wagon, although it was more common to see a single 'A' type container sitting in the middle of the wagon. 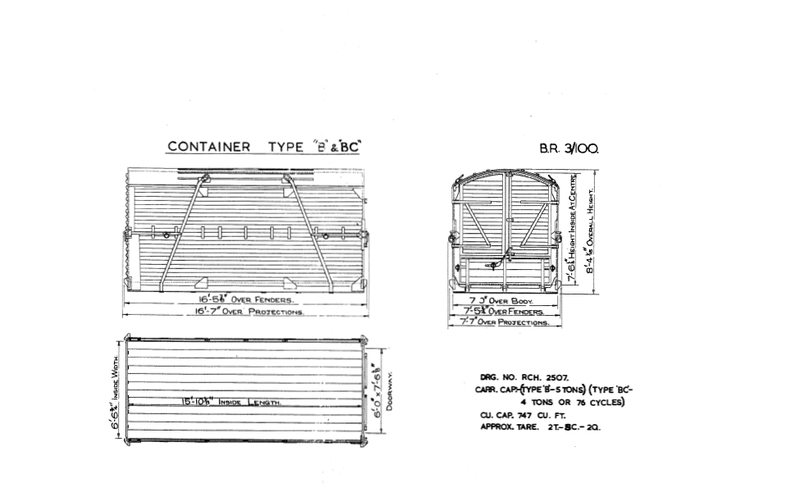 Apart from a handful of experimental containers, there were three basic designs: diagram 3/001 was the most numerous, with 3,800 containers made from wooden boarding with one end of pressed steel. Diagram 3/003 was similar but without the steel end, and diagram 3/002 was clad in plywood. A??? ?B at Loughborough, with A1610B alongside. Photo © P. Hetherington 11/12/04. This container's original number is currently unknown due to a more recent coat of paint. Much of the cladding has fallen off one side, and although this has been patched up with roofing felt to prevent further water ingress, the woodwork is in pretty poor condition. 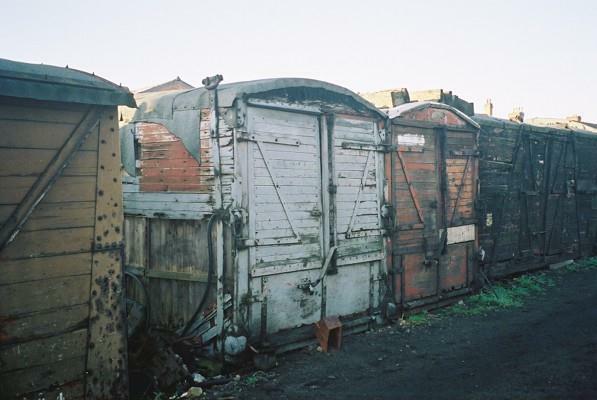 Currently used for storage at Loughborough GCR, it is hoped that this container may be made available for future restoration or, failing that, a source of spares. Diagram 3/001. Lot 2555 (420 containers), Earlestown 1954. With the recent movement of the adjacent container it is now possible to get a good view of the side of A1610B. Photo © P. Hetherington 22/01/07. The original number has been painted over but its identity has been deduced from other code numbers still visible. 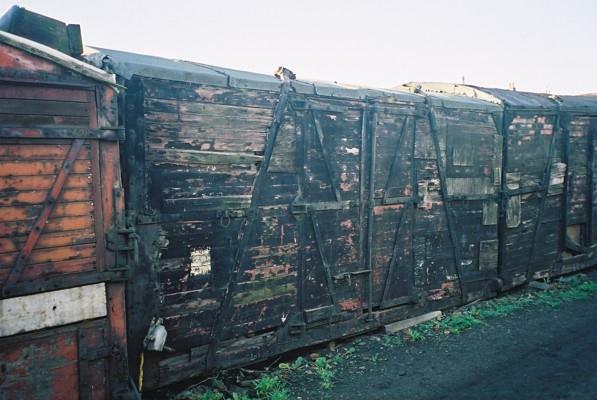 Currently used for storage at Loughborough GCR, it is hoped that this container may be made available for future restoration. 'AF' containers were small containers desiged for carrying frozen food. The 'AFP' was a slightly longer variant, the 'P' indicating that the food would be loaded on pallets. 136 wooden containers were built in 1958-59 and 6 experimental fibreglass containers were added in 1961; we have been fortunate in finding one of each. It is intended to restore both to their original 'Birds Eye' livery although reproducing this will be a challenge! The former LNWR branch to Loughborough Derby Road was already closed when these containers were built - in fact passenger services were withdrawn as early as 1931 - but both the goods shed and the locomotive shed survived in industrial use, the latter in considerably modified form. 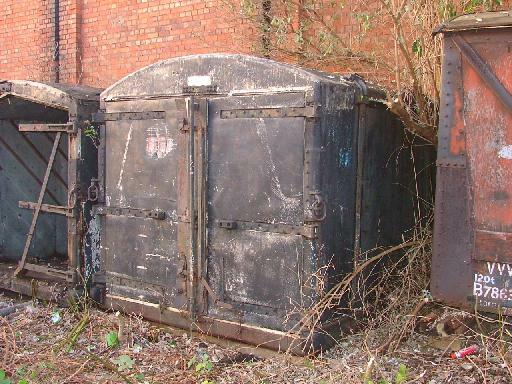 At some point in time the occupier of the locomotive shed acquired these two containers, and it is thought that they were used to store sacks of coal before eventually falling into disuse and decay, along with the locomotive shed itself. 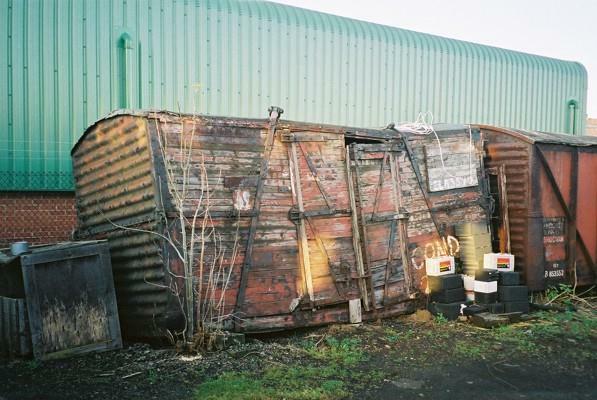 With the site due for redevelopment, the owner kindly agreed to donate the containers and they were rescued on 10/01/07. 'AFP' containers are an obscure size and can only be carried, in pairs, on a 'Conflat B' wagon. About which, more on the wagons page - under 'Future Plans'! Diagram 3/256, lot 3249, Swindon 1958. AFP66414B prior to rescue, showing the worst side. The remains of the doors have been stowed in the other container. Photo © P. Hetherington 28/12/06. The better side and the back of AFP66414B. This container has now been sheeted over to protect it from further damage. Photo © P. Hetherington 27/01/07. A similar container showing the original livery. The number on the caption is incorrect; it should say AFP 66370B. This container is in pretty poor condition. The doors have fallen off, and fallen apart too. Some of the framework around the doorway is rotten, and some of the cladding has fallen from one side and the back. The roof is anybody's guess, and when we moved it the insulation fell out of the floor - although the main structural timbers must be ok, as it kept its shape. And it does have one good side! If a better diagram 3/256 container comes to light then this one might become a parts donor, but at the moment no other example is known so the container remains in the restoration queue for now. Diagram 3/257, lot 3428, Mickleover 1961. AFP16496B prior to rescue. Traces of the words 'Birds Eye' and 'Insulated Container' are visible on the doors. Carefully rubbing down has revealed its number - rather surprisingly, in blue paint! 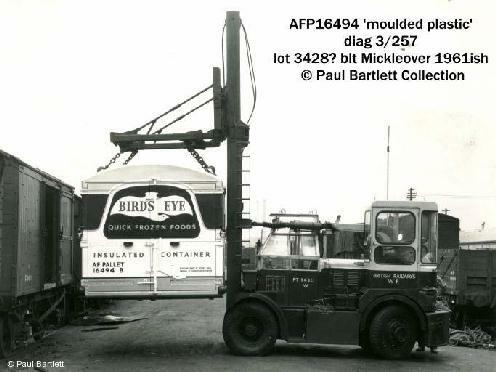 AFP16494B in happier times, being handled by a Shelvoke & Drewry 'Freightlifter'. 'Mickleover' is believed to be the name of a London-based contractor, rather than the Derbyshire town. Just six of these containers were built, numbered from 16494 to 16499, and their notable feature is that they were made from fibreglass at a time when BR were experimenting with different construction materials. Although this container is in generally excellent condition, there are some problems. 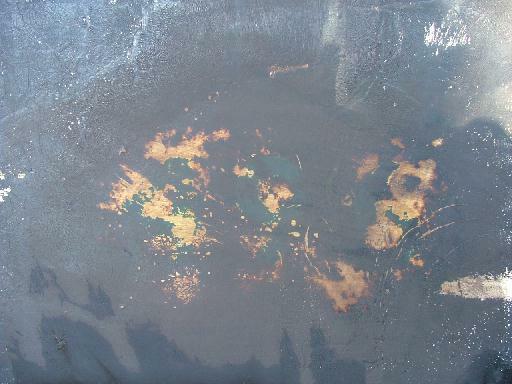 The floor pan has steel sills rather like those on a car, and they have rotted like those on a car too. Some of the door securing mechanism has been cut off, and a hole has been drilled in the back for a cable to be fed through. Despite these issues, this should be one of the easier restorations when the time comes. The 'B' type was effectively a double-length 'A' type, 16' long with doors at one end only. 50 light alloy examples were built in 1958, but the 325 containers to diagram 3/049 was a more traditional wooden design. 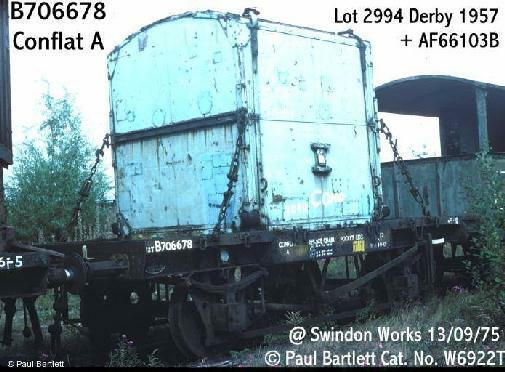 Two batches were built, lot 2888 (Swindon, 1956) comprising containers 55700 to 55849, and lot 2965 (Earlestown, 1957) comprising containers 55525 to 55699. Diagram 3/049, lot 2888 (150 containers), Swindon 1956. 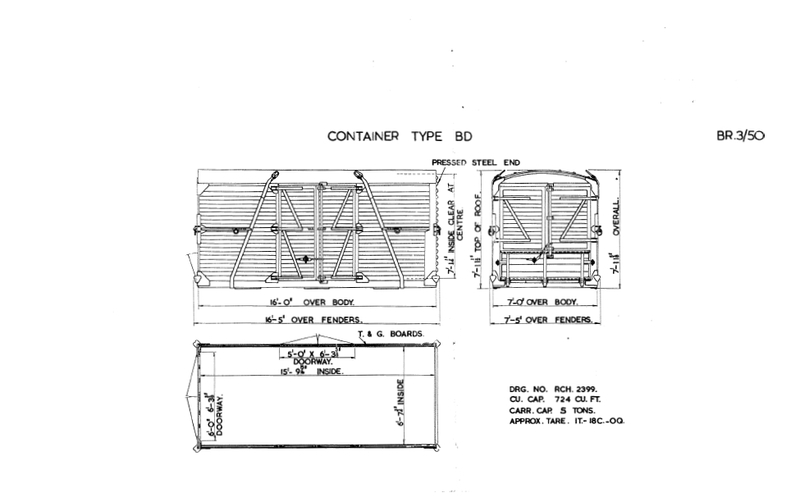 The diagram specifies tongue-and-groove boarding for these containers, but all of the evidence suggests that they were actually all clad in plywood. Certainly this applies to both B55733B and B55730B (the latter being at Bewdley on the Severn Valley Railway), as well as B55549B from the second batch (which is pictured in a book). This container was quite difficult to identify, but after much careful squinting under a strong sun, the number _5_73_B appeared as if by magic. The first two gaps can only be a 'B' and a '5' for this design, and the right hand side of the final gap is clearly either a '3' or an '8'. The curvature matches the adjacent '3' and so it must be another '3'; an '8' with this curvature would have to be wider and would not fit the gap. So, B55733B it is, probably, and unless anyone can prove me wrong. Unfortunately it is in poor condition; restoration will be a very long-term project. Essentially a 'B' type with the addition of racks to carry 76 bicycles, 351 of these were built between 1951 and 1957 to two similar designs: diagram 3/100 (285 containers) had boarded sides and pressed steel ends, while diagram 3/101 (66 containers) had boarded sides and ends. As the cycle manufacturer Raleigh was a famous Nottingham firm, there is a significant local connection, so a BC container is an important part of the collection. Diagram 3/100, lot 2833 (60 containers), Wolverton 1956. This container is in fairly good condition and it is hoped to restore it to the earlier maroon livery, traces of which are still visible if you know where to look. Another 'BC' from the same lot, BC9937B, was located at Loughborough GCR for many years. 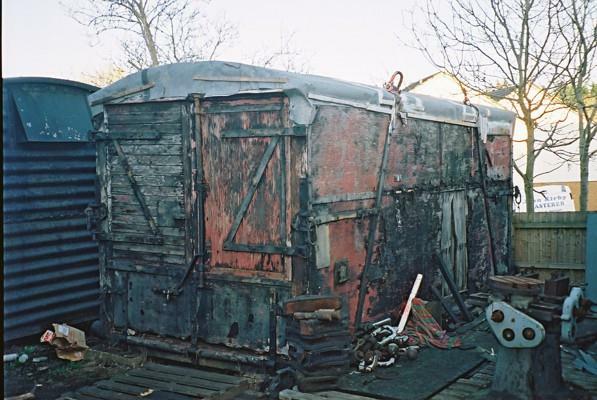 This was in very poor condition and was finally broken up in December 2006, although some useful parts were salvaged to assist with the restoration of some of the others. A metal repair plate with traces of its number painted on it was salvaged from the bonfire, so it was finally positively identifed when it had already been reduced to a pile of bits. Two further 'BC' containers have been viewed in the south of England. One has been re-coded 'B' following the removal of its bicycle racks, and is in fairly good condition. The other is from the much rarer diagram 3/101 design, but is in a fairly fragile state. Both containers may become available in due course. 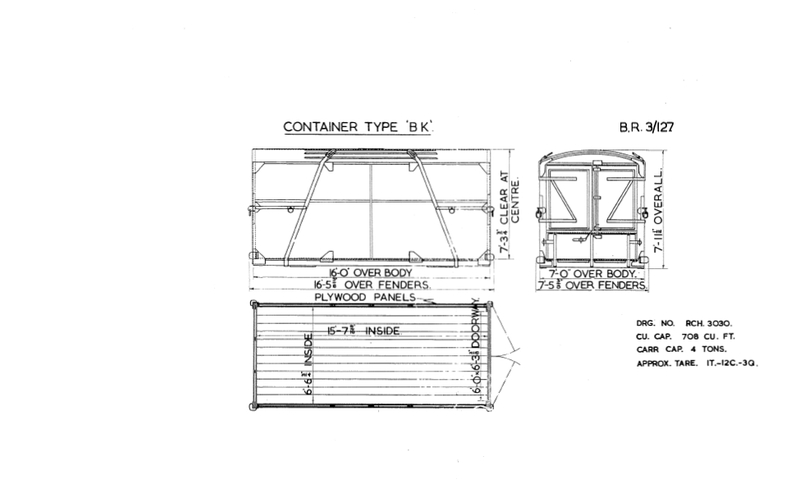 The 'BD' is basically a 'B' type container with the addition of side doors. These were found to assist unloading where the container could remain on the wagon, and this eventually became the most numerous container type with almost 10,000 examples built between 1949 and 1958. 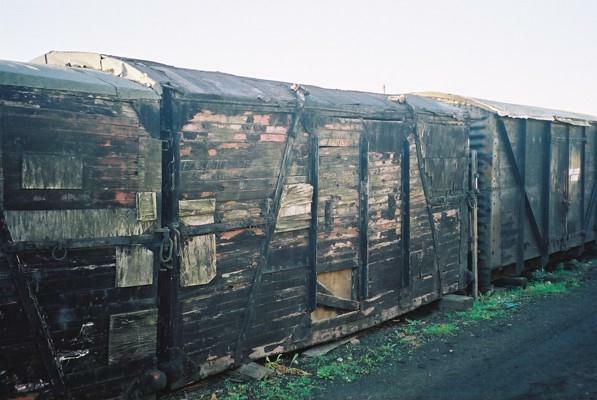 Over 9,000 of these were to diagram 3/050, of boarded construction with one end of pressed steel, and all but the last 400 were built at three former LMS wagon works: Earlestown, Wolverton and St. Rollox. Diagram 3/050, lot 2785 (1,500 containers), Wolverton 1956. Currently used for storage at Loughborough GCR, this container is in very poor condition and will probably be broken for spares. Diagram 3/050, lot 2786 (600 containers), Wolverton 1956. Currently used for storage at Loughborough GCR, this container is in fairly good condition and the owner intends to restore it eventually. Diagram 3/050, lot 2970 (550 containers), Wolverton 1957. 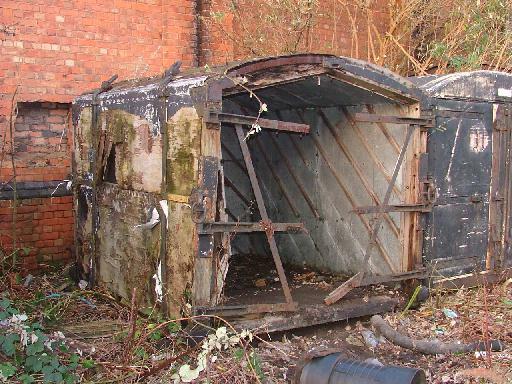 This container was donated by the Sittingbourne and Kemsley Light Railway where it had been used as a storage shed for many years. 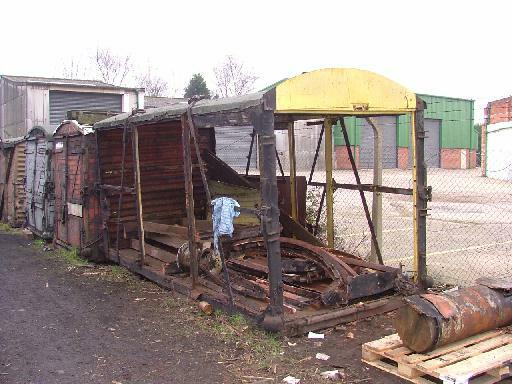 It was moved to the GCR on 11/06/05 and is currently awaiting restoration. As the pressed steel end is badly corroded, this will not be a simple job. Click here for a more detailed report on the rescue of this container. 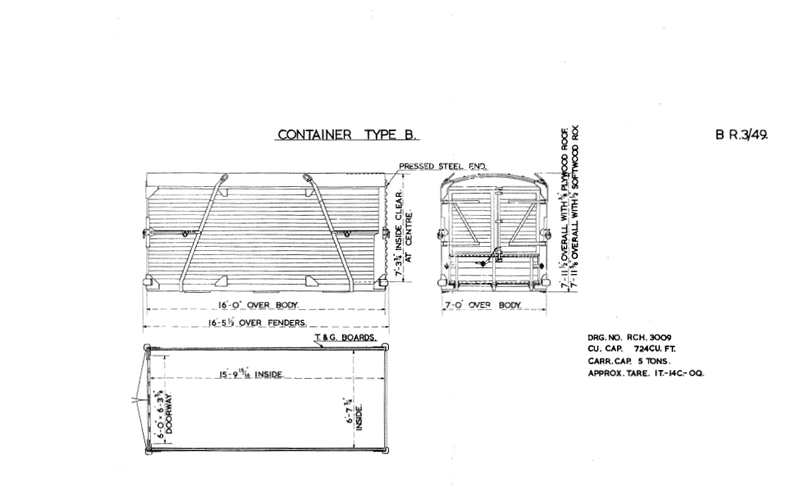 Diagram 3/050, lot 3131 (300 containers), St. Rollox 1957. Photo © P. Hetherington 26/12/06. 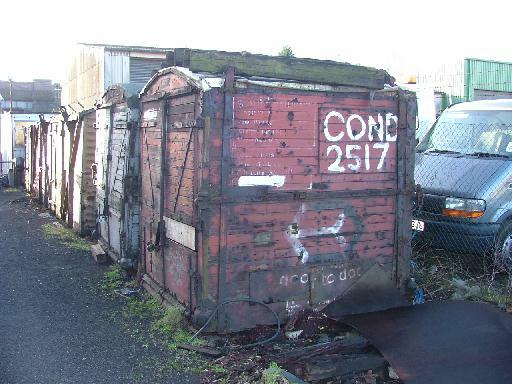 This container was used for storage at Loughborough GCR for many years, along with now-scrapped container BC9937B. The two were located end-to-end with the end doors removed, until December 2006, when a decision was taken to dispose of the pair. BC9937B was in very poor condition so was broken up, while BD50343B was stripped of its rotten cladding and side doors, and loaded with a pile of salvagable bits from both containers before being moved for further storage. Despite its current appearance, most of the important bits are still present so full restoration is not out of the question - and as the only St. Rollox container in the collection, it would certainly be nice to keep it. 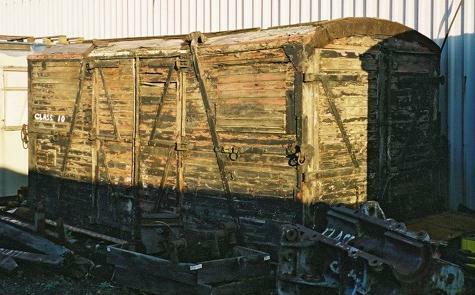 The main problem has always been the lack of end doors, but in early 2008 we dismantled a fire-damaged container at the Avon Valley Railway, co-incidentally the consecutively-numbered BD50342B, recovering a set of end doors and various other parts which should assist in any possible future restoration. These were similar to tbe 'B' containers, but were designed specifically for carrying furniture and were therefore provided with internal laths to secure the load. 1,435 were built to three very similar designs, but were of all-plywood construction which has ensured that few have survived. Unidentified BK conainer at Kemsley, Kent. The white plywood sheet was covering a large hole in the side which, after a 200 mile road journey, is now even larger. 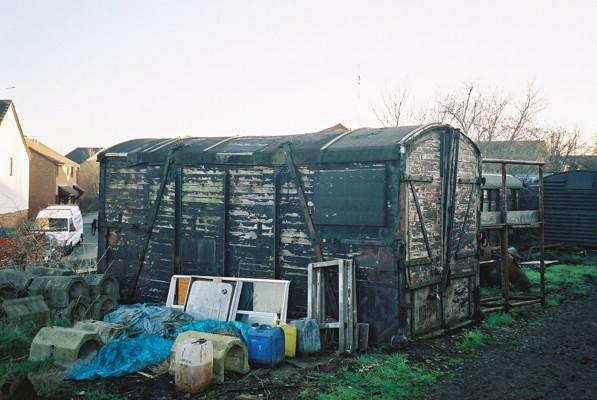 This container was donated by the Sittingbourne and Kemsley Light Railway where it had been used as a storage shed for many years. Its original identity is currently unknown, although some clues have been uncovered; see the number theory page. As a diagram 3/127 container, its original number would be between 8685 and 9434. Three lots were built at Earlestown, Faverdale and Swindon. It seems most likely that this is one of the 1958 Swindon-built examples. This container is in fairly poor condition but the type is of some historic importance as the predecessor to the ubiquitous 'Pickfords' lorry - many people would have moved house in one of these before the coming of the motorways. 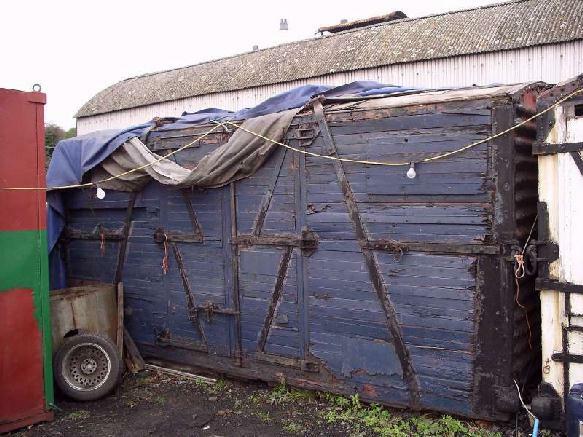 As a furniture container it also provides a direct link to the 'lift vans' of the 1890s. Unfortunately someone drove into it at its previous location, and some more bits fell off on the way up to Leicestershire, so one side now requires complete replacement. This container will be the first to be rebuilt, as any delay will probably cause it to deteriorate to the point of no return! 'D' type containers were open containers, 14 feet by 7 and with a six-plank body, and were never particularly popular - 1,975 were built, 465 at Eastleigh and the remainder at Earlestown, but they are thought to have been withdrawn fairly early. They were numbered from D21000B to D22974B. Photo © P. Hetherington 09/01/10. 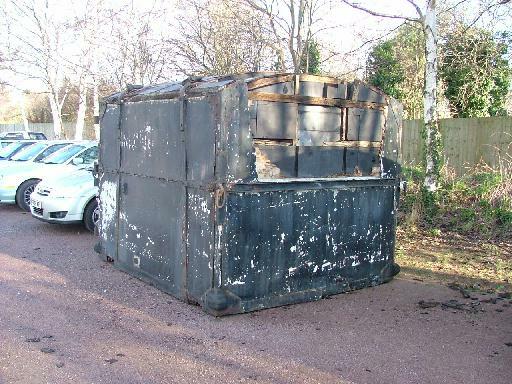 The remains of this container were found dumped on the cattle dock at Ruddington. It is thought to have been damaged in a derailment in BR days and simply left there to rot. The remains were discovered when the preservationists arrived some years later and have since been stored in the open; they have now been stowed in a box van which should at least help to conserve them. Some parts are missing but the remains could, one day, form the basis of an ambitious rebuild, or replica if you prefer. Needless to say, we do not know this container's number! Although the GCR collection represents most of the more common types, there are a few notable omissions. Some of them are listed here, but in practice there were too many weird and wonderful variations to list them all. 'AF' or 'AFU' type container. A typical 'AF' container mounted on a Conflat wagon in BR days. 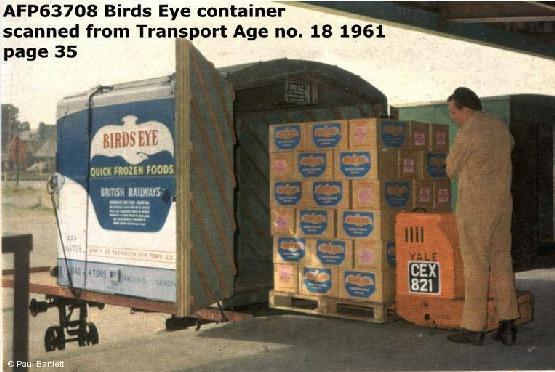 These were half-sized insulated containers used for carrying frozen food. There were several diagrams covering different insulation materials and the presence (AFU) or absence (AF) of eutectic plates, which could be charged up at the producer's factory to help to maintain the temperature. 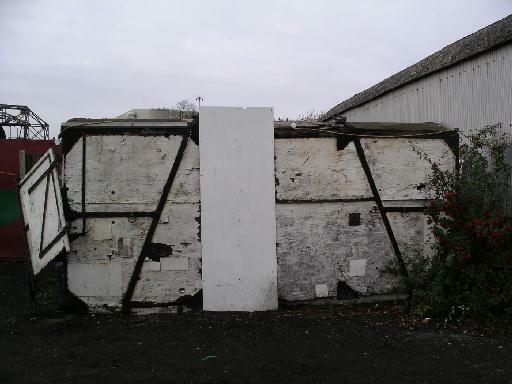 An unidentified 'AF' container was found in a field in Northamptonshire and was considered a candidate for restoration. However, having traced the owner and hired a lorry to collect it, it turned out to be in much worse condition than first thought and impossible to lift safely. The rescue bid had to be called off and the container has been left to rest in peace; it nearly ended up in pieces. An expensive and frustrating mistake! These were a highly insulated top-loading container intended for the carriage of liquid carbon dioxide. Just 240 were built. It seems unlikely that a top-loading container would have found any further use once the traffic ceased, so I don't really expect to find one. 'B' type 'light alloy' container. Another experimental type, just six of these were built. They are shorter than the standard 'BD' containers and look quite distinctive. At least two of these still exist: one is destined for another preservation group, while the other is in industrial use as a store. 'BM' and 'FM' type containers. The 'BM' was a variant of the 'BD' type, fitted with internal meat hooks for the conveyance of carcasses. The most notable external features were the ventilation louvres in the sides. 1,305 were built, mostly of tongue-and-groove boarding but 40 were clad in plywood. The 'FM' was similar but insulated (and therefore without the louvres), for conveyance of frozen meat. 3,885 were built to six diagrams, some boarded and others of plywood. If one of these can be found it will be painted white. 'C' and 'D' type containers. These were open containers, and were much rarer than the covered type, with just 790 'C' and 1,975 'D' types built, the last in 1954. They were withdrawn relatively early, so the chances of finding an intact survivor are slim. The 'C' had internal dimensions of just six by seven feet, the 'D' was more like a traditional open wagon body. There was also a 'DX' version with removable sides (150 built). We do have the remains of a 'D' container (see above) but turning the remains back into a container would be a major project, so if a better survivor surfaced it would certainly be considered. Believed to stand for 'hod', over 4,000 of these small containers were built for the movement of building materials. These were just 6'9" long, 3'9" wide and 1'10" tall, yet could carry over 2 tons each. Apart from the Conflat A, the only other Conflat wagon built by British Railways in large numbers was the Conflat L. We don't have one on the GCR, but there are preserved examples elsewhere. But, to the best of my knowledge, none of them are carrying their original 'L' type containers. 'L' type containers were strange looking things intended for the conveyance of limestone and were designed for top-loding and bottom-discharge. Three were carried on a single wagon. The chances of finding any are probably slim, as they were unlikely to find further use when the traffic ceased. However, a few did survive in traffic into the 1980s. 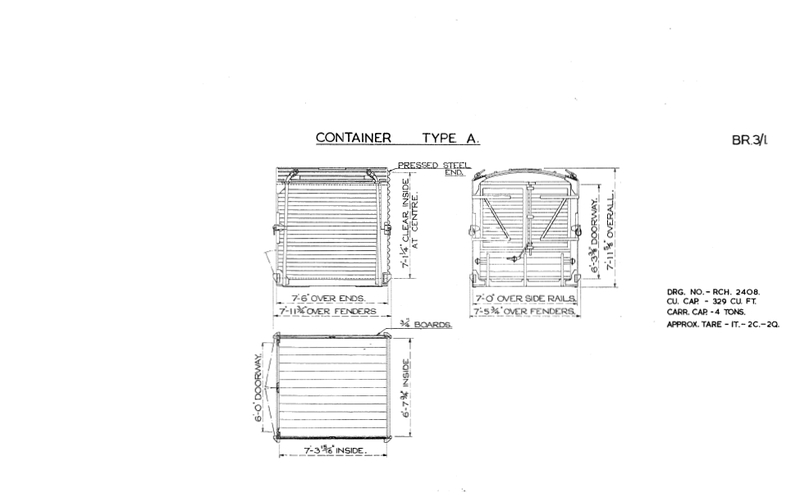 'LF' and 'LT' type containers. These were effectively a top-loading, bottom-discharge variation of the 'A' type. Depending on which section of the book I believe(!) there were either 17 or 22 built, and they were either for bulk flour or malt. I doubt we'll ever find one. Much of the information on dimensions, diagrams, lots and numbering has come from 'British Railways Wagons' by Don Rowland. Some information was taken from a photocopied article, the origins of which I do not know. Further details and references are on the acknowledgements page.